The most abundant reptile found across Galapagos, lava lizards are a friendly sight at almost all the tourist destinations. They are often seen having press up contests to find out which lizard is king! Lava lizards are some of the most abundant reptiles throughout Galapagos. They look similar to miniature iguanas and are often found in large groups warming up in the sun atop lava, which gives the group its common name. There are seven species of lava lizard from the genus Microlophus found across the Archipelago, with a further 15 species found along the Pacific coast of South America. Apart from the location of the lizard, it would be near impossible to tell the difference between two lizards based on their physical appearance alone. Any individual can range from grey to green or brown and even black. The males tend to be brighter coloured with yellow specks or gold stripes. The females can have a red throat or head. The male tends to be larger than the females and have a distinct spinal crest along the ridge of their backs. Males also have rougher skin with more patterning. A male lava lizard’s territory can cover up to 400 sq metres and often crosses several females territories. To ward off competitors from his territory, the male can often be seen performing a series of ‘push ups’ to intimidate the opponent; often these displays are carried out on man-made structures such as fence posts or signs. The push ups make the male appear bigger and stronger and can dissuade other males from wasting their energy by starting a physical fight. If an intruder feels that he is bigger and stronger than the incumbent male, then a push up contest may occur. If the contest is still not over then tail slaps or biting is often the last resort. Breeding takes place in the warmer months and females can become sexually mature after only nine months. Males take longer to mature at up to three years. Females lay four to six small eggs, the size of a pea, in a deep burrow in soil. The eggs incubate for three months until they hatch. 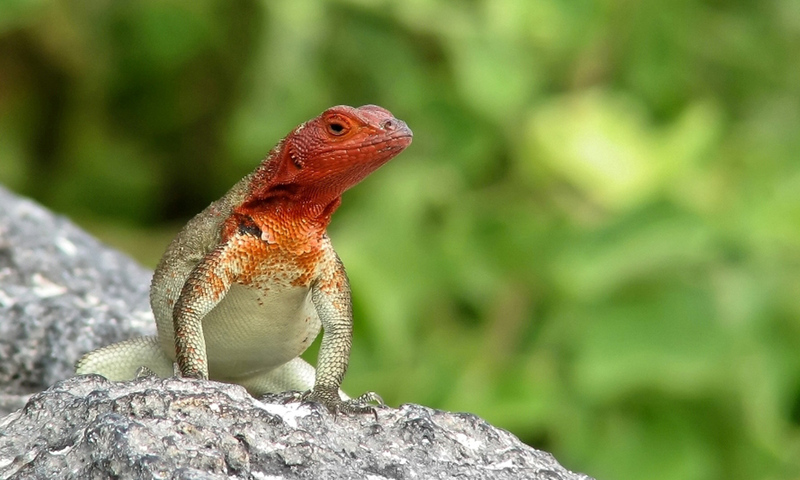 Where to see them: Lava lizards are found on all islands except Genovesa, Darwin and Wolf. The Galapagos lava lizard is found across ten of the central islands, whilst the other six species are named after the single islands they are found on. 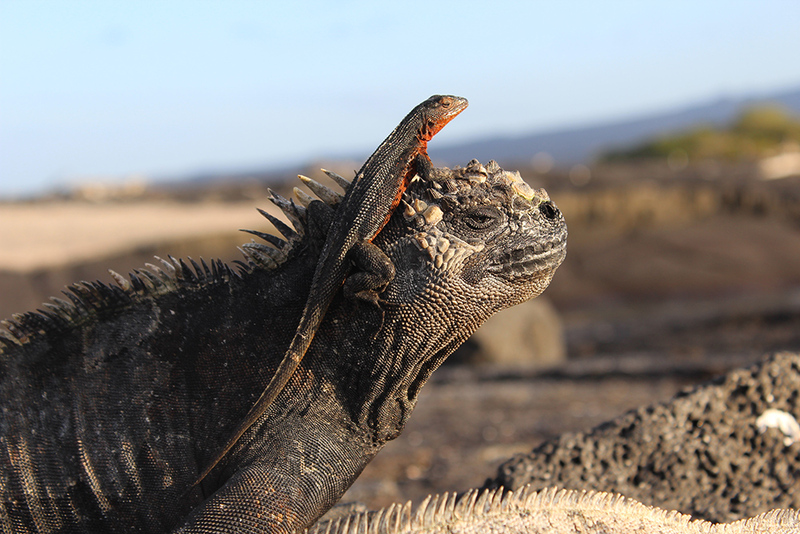 They are mainly found in the lowlands, especially along the shoreline, intermingled with groups of marine iguanas basking in the sun. When to see them: Lava lizards are common all year round. They are active during the day. Threats: The natural predators of lava lizards include Galapagos hawks, herons, snakes, scorpions and cannibalism from other lava lizards. The conservation status shows that the species is not under immediate threat. Like all Galapagos species they face the threats of global warming, El Niño events and habitat destruction caused by humans. Conservation actions: Whilst some of the lava lizard species are labelled as vulnerable by the IUCN Red List there are currently no specific plans in place in Galapagos to protect them however they are generally protected by the Galapagos National Park. Please help us to protect the vulnerable wildlife of Galapagos by donating today. “Imps of Darkness”…when Darwin was wrong!